The grandfathers of Mr Hatoyama and Mr Aso were rival leaders in the 1950s. 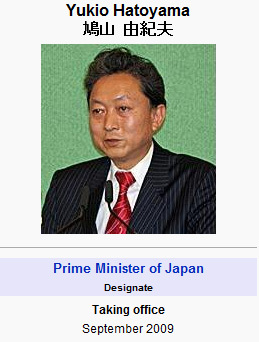 Yukio Hatoyama, the DPJ leader, a wealthy Stanford University-trained engineer. 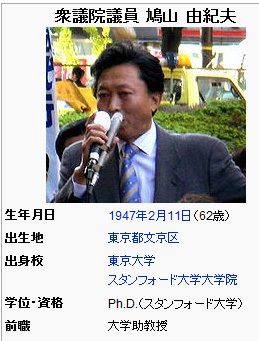 Aloof and professor-like, Hatoyama is not seen as charismatic and has a tendency to be verbose and dismissive. He has been nicknamed "the alien" because he can come across as eccentric. Yukio Hatoyama, 62, a Stanford-trained engineer who will probably be chosen prime minister in mid-September. ©Mami Yamada 2000-2009 All Rights Reserved.